Gateway Arch - Stephen J. Kelley, Inc. Historic Structure Report and Condition Assessment of the exterior skin of the Gateway Arch in St Louis, Missouri. 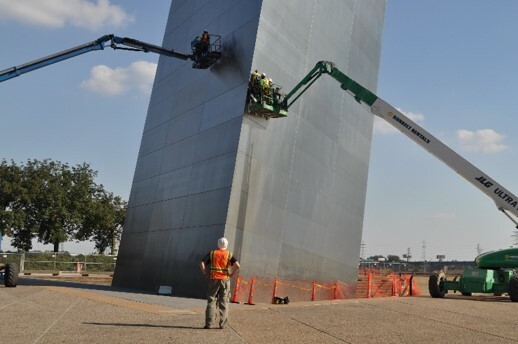 The Gateway Arch is constructed with a 1/4 in. stainless steel exterior skin and steel interior skin and is quite possibly the most fascinating and important stainless steel structure ever constructed. 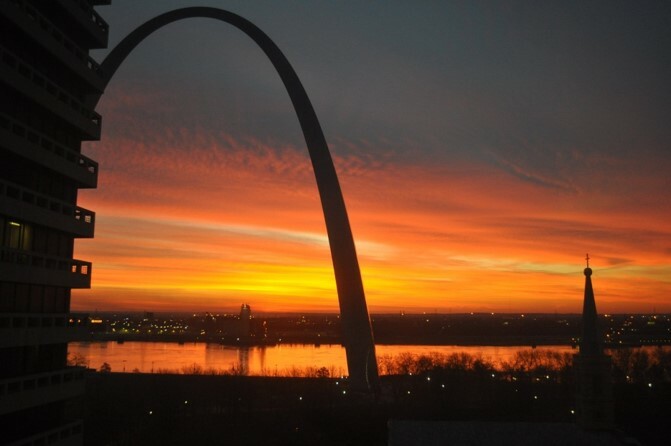 Commemorating westward expansion and designed by Eero Saarinen, the Arch was constructed between 1963 and 1965 and has a basic shape of an inverted catenary curve with the Arch legs equilateral triangular in cross section. Both the height and the span are 630 ft.
A Historic structure Report was completed. Then a study was performed on the stains on the exterior skin. 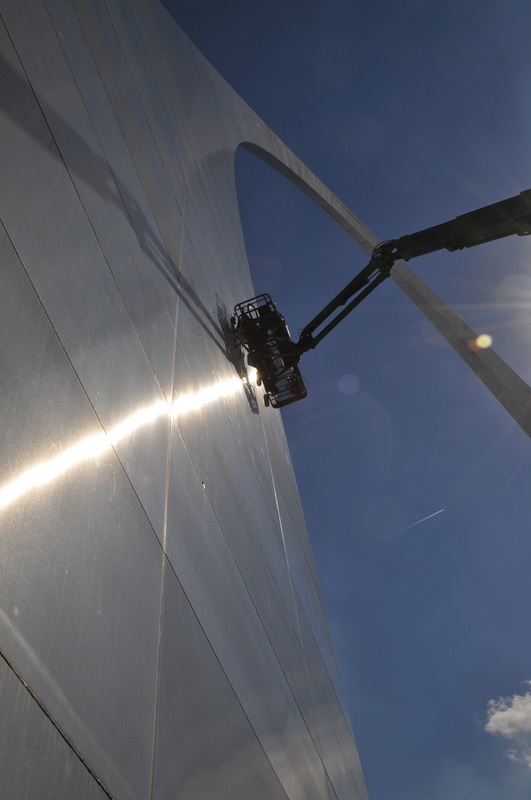 Archival research was performed on other stainless steel clad structures in the United States and Europe that predate or are contemporary with the Gateway Arch. It was found that these monuments had weathered well but that the Arch stands alone from other monuments in its extensive use of shop and field welds. 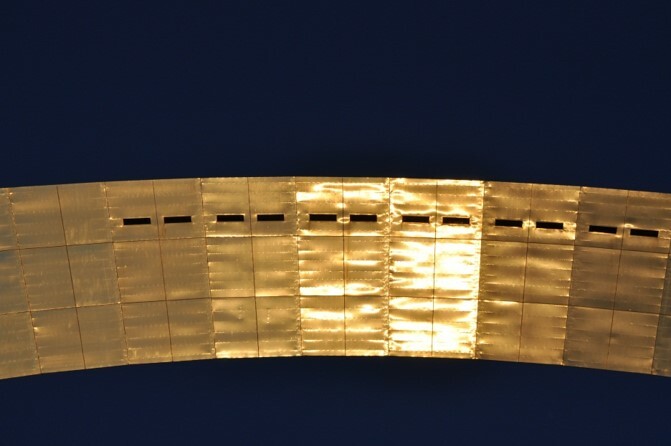 The exterior surfaces of the Arch intrados were visually inspected using telephoto photography, field microscopes, and a hand held XRF device. A series of inspection openings were created through the interior carbon steel skin in order to view the space between the two skins. 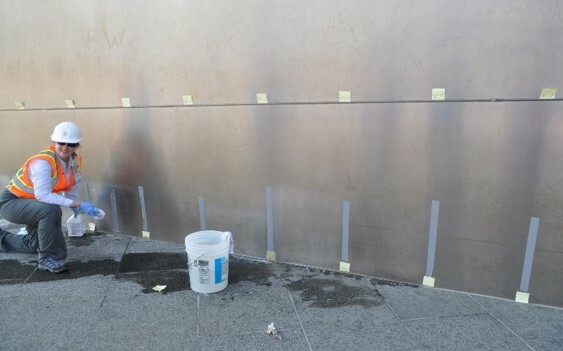 Samples of carbon steel and concrete were removed from the legs of the Arch for testing in the laboratory. 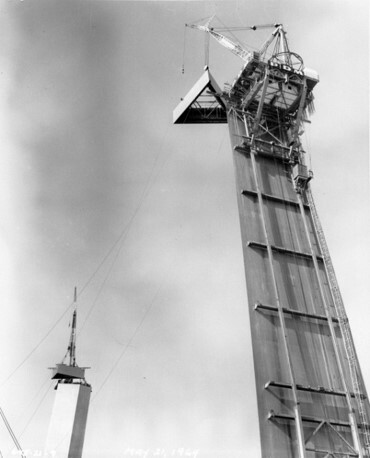 Long term monitoring instrumentation was installed within the legs of the Arch. It was found that there is a propensity for condensation on specific spring and fall days. 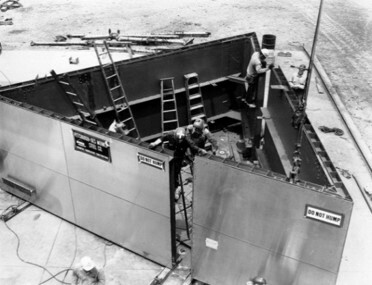 Sample cleaning was performed at the base of the north leg and personnel; lifts were utilized to remove weld samples for laboratory testing. Finally difficult access was utilized to perform close up inspection and soiling sample removal on the upper reaches of the Arch intrados. Kelley managed this project while at WJE.